With rates of depression (20%) and anxiety (10%) among cancer patients, an onus on identification and effective treatment is highlighted, especially given the detrimental impact on survival. Depression and anxiety can be complex and assessment time consuming. In a cohort of patients where management is already intricate, the practicalities of effective mental health treatment is challenging. When issues are not addressed, frequently it falls to the GP to manage, who themselves are faced with the obstacles of time and resource pressures. Cancer services require dedicated specialist psychiatry provision. At a time when the NHS is continually facing a funding crisis, will we ever reach a service which can meet the ever growing health needs of the population. Cancer Centre, Belfast City Hospital. Why promote antidepressants associated with QT prolongation when safer alternatives exist? 1 Pitman A, Suleman S, Hyde N, Hodgkiss A. Depression and anxiety in patients with cancer. BMJ 2018;361:k1415. 2 Ojero-Senard A, Benevent J, Bondon-Guitton E et al. A comparative study of QT prolongation with serotonin reuptake inhibitors. Psychopharmacology (Berl) 2017;234:3075-3081. 3 Prescire International. Citalopram, escitalopram: no more effective than other SSRIs, but more toxic Prescrire Int 2016 Apr;2:98. 4 Prescire International. Venlafaxine: more dangerous than most "selective" serotonergic antidepressants. Prescrire Int 2016;25:96-9. 5 Prescire International. "Towards better patient care: drugs to avoid in 2018”. Prescrire Int 2018; 27107-1 - 107-9 available at http://english.prescrire.org/en/AA26644A665789B5BD5C3814F73AE19D/Downloa... accesses 2 May 2018. Pitman et al gallantly attempt to help colleagues through the prescribing pitfals that beset us in treating patients on drugs with lots of Side effects, Contraindications and Interactions - not just their target ones of Depression and Anxiety. That the subject is extremely complex is brilliantly demonstrated by the two page visual summary (not visible in my online version) which I had great difficulty in 'getting my head round'. Inevitably errors have crept in as in their advice to prescibe 'Venlafaxine to treat depression in women taking Tamoxifen for breast cancer to exploit its dual effect in reducing hot flushes.' This is wrong. Hot flushes are a Side effect of Venlafaxine not an Indication . Its prescription will only make the problem worse. Getting information out of manufacturers' Specifications of Product Characteristics (SPCs) is painfully difficult without using a suitably designed, executed and maintained up-to-date database. Competing interests: Weeks is the original author of the World Standard Drug Database which relates coded patient condition attributes to the coded attributes of drug ingredients. Apart from harvesting spiritual benefits and Divine help, cancer patients who turn to religion can also expect concrete clinical results. Religious CBT is effectively used to treat clinical depression and depression associated to chronic illnesses, without any of the serious side effects and cross reactions antidepressant pills induce. Thank you for the comprehensive and elegant summarization of the neuropsychiatric aspects of cancer. 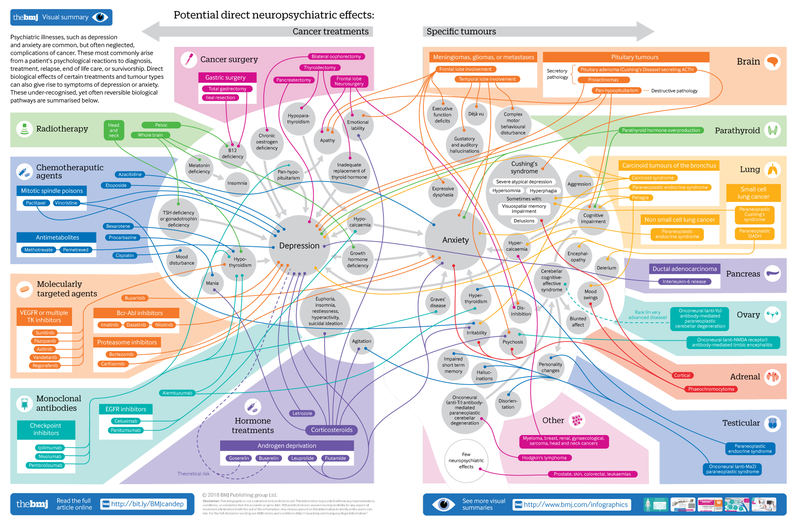 The visual summary, though it appears rather complex, gives a handy mind map of the various ways in which different cancers and their treatments can contribute to neuropsychiatric sequelae. Many thanks to the patience and imagination of the illustrator/s. Depression and anxiety are quite common in clinical practice with reference to cancer. The neuropsychiatric presentations are as varied as the people affected by them. The presentation, course, prognosis and outcomes seem to be determined and affected by each individual’s personality, coping strategies adopted, family and social support, living and working environment and personal beliefs and spirituality. This multidimensional characteristics of the neuropsychiatry of cancer indeed requires a multidimensional evaluation, diagnostic formulation and management plan which would most certainly benefit from a multidisciplinary team of professional involvement. Reselience in the wake of adversity requires skills informed by reliable facts and proven practices to enhance adaptability, thriving and nurture to influence existential crisis that cancer challenges at the individual, family and societal levels. As highlighted by the fact that this article is presented as a continuing medical education activity, education is indeed the key to wisely inform and skill all involved in decisions and practices including not only the members of the multidisciplinary professional team but also the patient, patient’s family and social circle, and perhaps the wider community to dispel myths, break irrational beliefs, allay fears and counter stigma and motivate living. As important and essential as the medical treatment may be in the neuropsychiatry of cancer management, equally important and essential is the process of EMPOWERMENT of the individual suffers, their families and the community through a system of extended remedial education and therapy that takes into consideration the psychological, social, environmental and spiritual dimensions of existence. Other readers may love it, but it seems to me that the infogram accompanying the article may exceed what may be useful visual stimulation. One of the main efforts of Frank Netter, the great medical artist, was to know what details not to include. This may be one of the reasons why his work is still so memorable these days.